A new Space Race is afoot, but it’s not between the United States and Russia. This time it’s between two U.S.-based companies: SpaceX and Blue Origin are both vying to bring the internet to space. This latest chapter in the rivalry between SpaceX’s Elon Musk and Blue Origin’s Jeff Bezos concerns who will get to provide satellite internet to Earthlings and, eventually, space travelers. 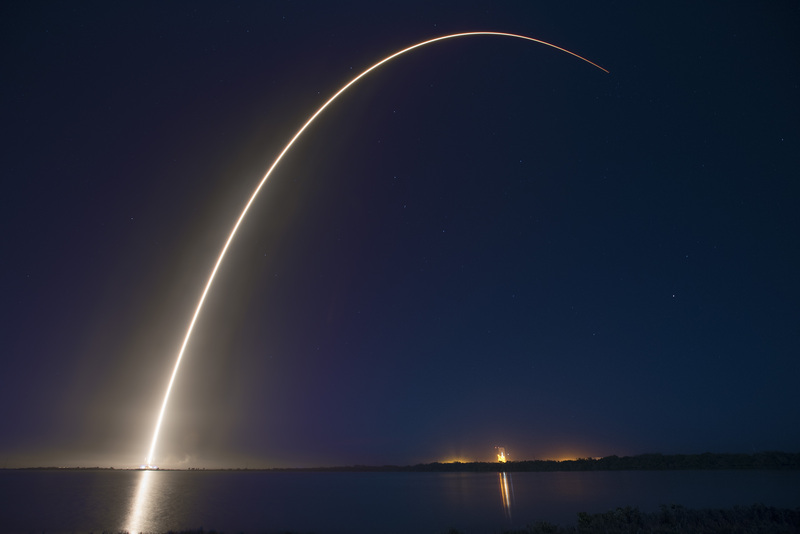 This week, news surfaced that SpaceX has been quietly meeting with the Federal Communications Commission about launching a constellation of internet satellites. A public FCC disclosure shows that SpaceX met with the FCC on February 28 and March 9. At those meetings, SpaceX officials discussed the company’s hopes for a license that would allow it to create a constellation of internet satellites. A “space internet” satellite constellation could support communication for crewed spaceflights in the future. Until we’re sending rockets to mars, though, it could help provide fast, reliable broadband internet coverage to people all over the world. The United Nations recognizes internet access as a basic human right, so bringing global broadband coverage to people in developing nations or rural communities could be a victory for humanity. The question remains, though: Who gets to do it? The Verge points out that the FCC will likely allow multiple companies to operate internet satellites simultaneously, but that once a leader emerges, funding and regulatory favor for the others will promptly dry up. This means that the venture could be a huge financial success for the winner, but a massive loss for the loser. SpaceX is already working on it. The company filed an FCC proposal for this “space internet” idea in November 2016. It proposed 4,425 non-geostationary satellites that would provide global broadband internet coverage. As an added bonus, the revenue would help pay for Mars missions. In 2015, Musk said he planned for a satellite internet network, not only for people on Earth, but also to provide a much-needed communications infrastructure for Martian colonists. Since 2015, though, others have begun doing it. Chief among them is Blue Origin. This month, Bezos’ company agreed to launch satellites for the company OneWeb, whose mission is to provide global broadband coverage via — you guessed it — a satellite constellation. Blue Origin’s launches, starting in 2021, could accommodate up to 400 internet satellites for OneWeb. It’s safe to say that the SpaceX and Blue Origin rivalry is reaching new heights in the race to support a global “space internet.” SpaceX is a bit behind the ball, though, compared to Blue Origin and OneWeb. Not only have OneWeb and Blue Origin already scheduled satellite launches, but OneWeb also filed its FCC application six months before SpaceX, in July 2016. In fact, it was this filing that made the FCC call for more submissions, which in turn led to SpaceX’s November proposal. So while SpaceX may be the more visibly active of the two companies, with a packed launch schedule, Blue Origin has been making steady moves to be the first to launch the “space internet.” The world anxiously awaits the next developments in this new Space Race.